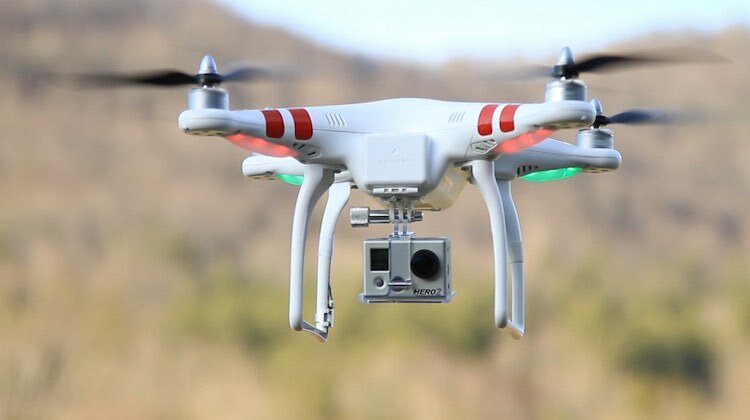 The DJI Phantom Drone 1 weighs about 1.2 kilograms. Australia’s Civil Aviation Safety Authority (CASA) has introduced new rules for recreational users of remotely piloted aircraft systems (RPAS). Under the new rules, recreational users are prohibited from flying these aircraft, commonly known as drones, within 5.5km of any controlled aerodrome, which covers all capital city airports and some at regional centres. Drones, which have surged in popularity in recent times, are also prohibited to be flown within 5.5km at non-controlled aerodromes or helicopter landing sites when it is clear aircraft are operating there. Further, drones must be kept below 400ft and not get any closer than 30m from people not involved the operation of the drone. Also, recreational users can only fly one drone at a time, CASA said on Friday. “The new rules will better protect people and aircraft from drones. They focus on the operation of recreational drones,” CASA said in a statement. CASA said those holding a remote pilot licence (RePL) and operating drones according to a remotely piloted aircraft operator certificate (ReOC) or those with an authorisation from CASA, would be exempt from the new measures. The new rules also prohibit all drones – both recreational and non-recreational – from being used where fire, police or other emergency operations are underway, unless there was approval from the person in charge of the emergency operation. The regulator also reaffirmed existing rules that do not allow drones from flying over and above crowds and groups of people, as well as regulations that only allow flights during the day and within visual line of sight. CASA chief executive and director of aviation safety Shane Carmody said the new rules still offered plenty of opportunities for those who fly drones for fun. “We certainly don’t want to ban recreational drones but we do have to make sure public safety is properly protected,” Carmody said. “CASA identified some areas in the drone rules that needed strengthening and clarifying to better manage the risks associated with flying drones. More information can be found on the CASA’s new drone website. The new regulations have been introduced as CASA continues its review into the commercial and recreational operations of drones. The CASA report was due to be released by the end of 2017. Its discussion paper, published in August, noted there were about 50,000 drones used in this country currently, mostly for sport and recreational purposes. Submissions for public comment closed on September 29. See occasional drone hovering 50m above house, most likely with HD camera and my kids in our pool and neighbours kids in their pool. Surely there can be a law to stop this? They can fly their toy drones at a local park. Not before time. All drone operators need to be registered at least, if not formally licensed. It should be a condition of purchase that the proposed operator’s details be recorded and registered against the serial number of the RPAS being purchased for them (business applications would need to declare a “responsible person” against whom the drone could be registered). RPAS provide unlimited cost-saving advantages for industry and can realise huge savings in monitoring requirements, e.g. high tension wires surveillance and building/tower maintenance, but recreational use is an entirely different matter. There also needs to be a minimum age limit mandated for RPAS operations. I was under the impression that these new rules had been in place for a while anyway. As far as privacy goes, my drone has a 4k camera on it and you’d be surprised how close you have to get to objects to actually see detail. If you’re 50m up in the air, the picture isn’t going to provide a great deal of recognisable detail on a person given the lack of zoom most recreational drones have. A misconception a lot of people have is when they see a drone, it automatically must be spying on them and taking photos/video… I’m not saying this doesn’t happen, but give us the benefit of the doubt. Ask the person if you’re worried and you can find them.